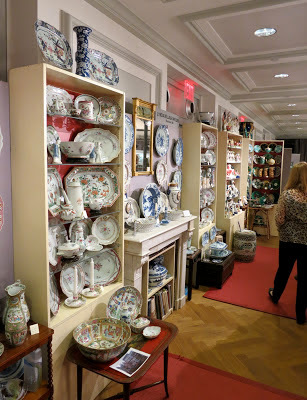 Wednesday night I slipped out of work early to head uptown to visit the New York Ceramics Fair, which is being held this Antiques Week at the Bohemian National Hall on the Upper East Side. This year's Ceramics Fair brought together thirty dealers of historical to contemporary porcelain, pottery, and glass from across the United States and England. The Fair was a bit smaller this year, with a handful of notable absences from its roster of dealers. I wonder, is it because the public's taste for fine ceramics is waning, or is it a function of a still-ænemic economy? 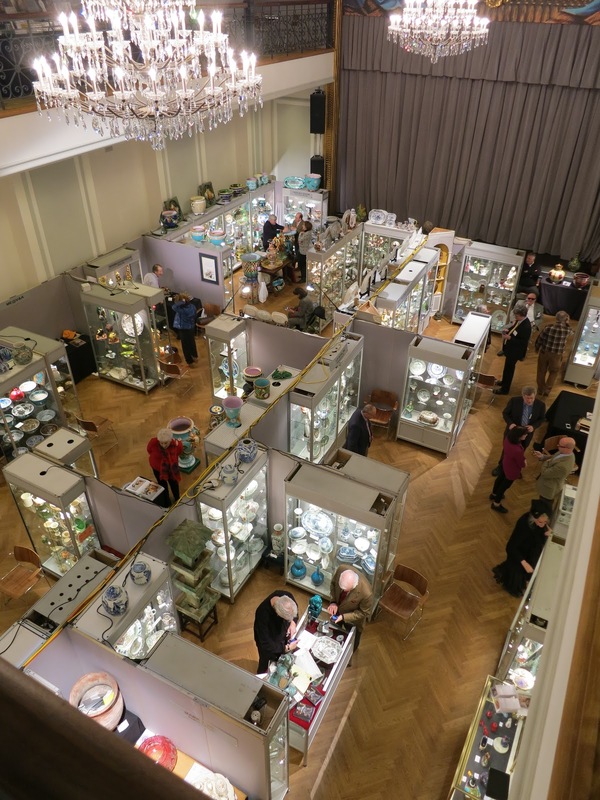 Notwithstanding, the Fair remains one of the highlights of Antiques Week for Reggie and Boy, and we have done major damage to our bank accounts in its rooms over the years. Should you be so fortunate to find yourself there, Dear Reader, you will understand why—it is an Aladdin's cave of ceramic treasures! 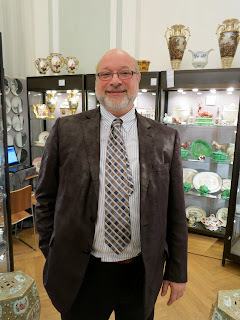 attendee at all the New York City antiques shows. I've seen her prowling the aisles of them for many years . . . 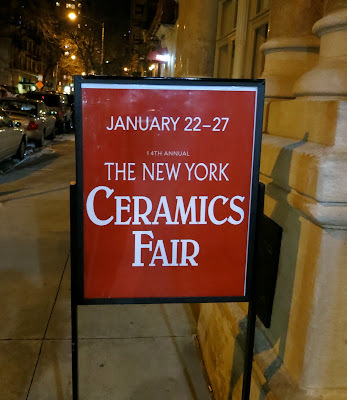 The Ceramics Fair is being held for the second (or is it the third?) year in the spacious, two-storey auditorium of the Bohemian National Hall, with dealers' booths spread across the main floor of the room and also the balcony above. Our first stop was at the booth of John Howard, hailing from Oxfordshire, England. 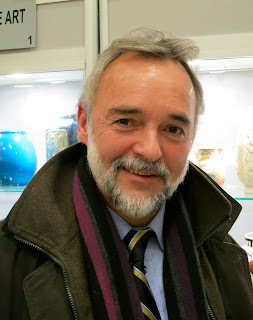 Mr. Howard specializes in early English ceramics and has been the source of a number of our purchases over the years. Two years ago we bought from him a superb early-19th-century pearlware bust of the Goddess Minerva, in the Classical taste. 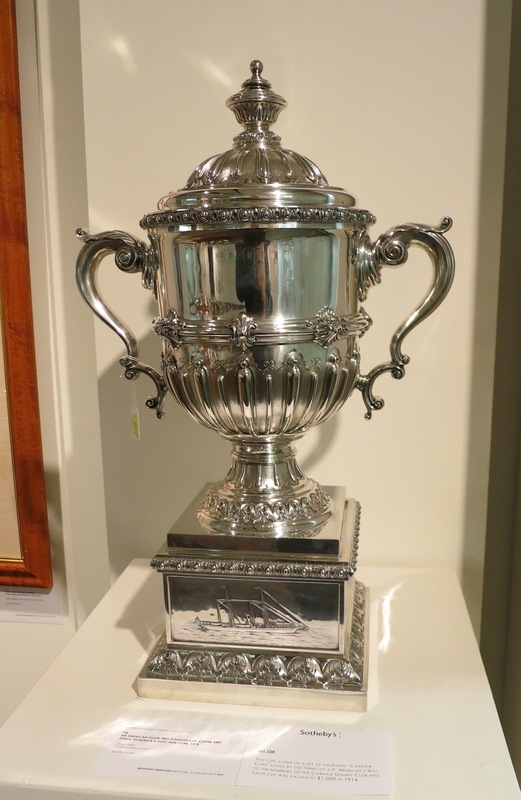 It is one of the treasures of our collection at Darlington House. John Howard's booth was a jaw-dropper! This year Mr. Howard was joined by a friend and colleague named Ms. Myrna Schkolne, who is an expert in English Staffordshire ceramics of the 1780-1840 period. 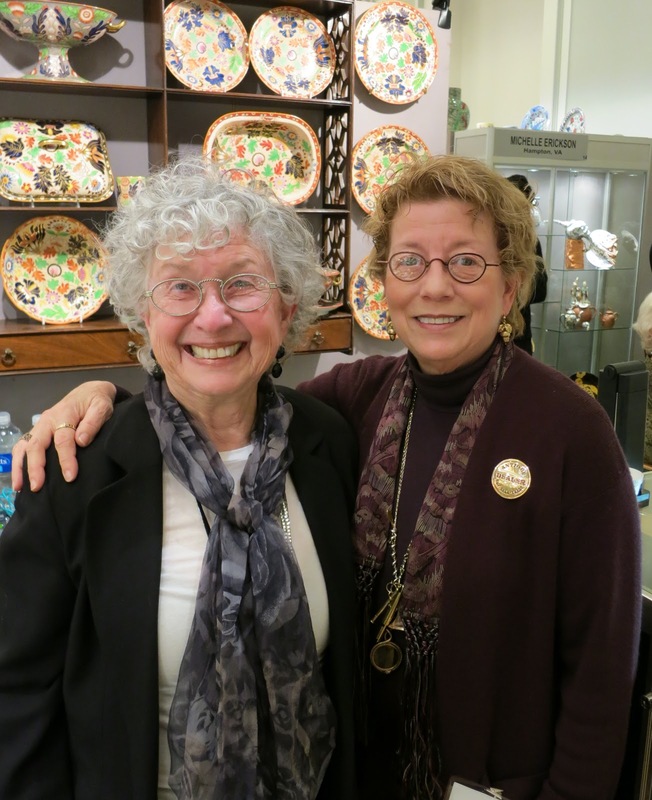 Ms. Schkolne is a noted author on the subject (we bought one of her books from her that evening) and is about to come out with the first of a four-part series—likely to be the definitive one at that—on English Staffordshire pottery of her specialist period. I am looking forward to adding her series to our reference library. Mr. Howard's booth features a delightful selection of Staffordshire animal figures this year. 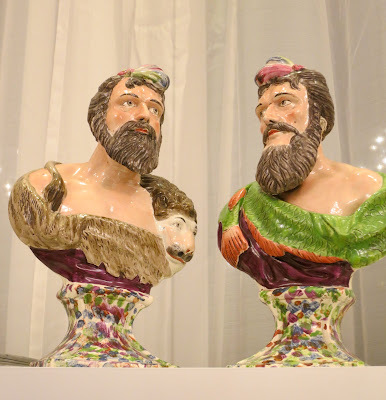 The pair of hirsute, early nineteenth century pearlware busts shown in the following photograph were right up my alley, but I resisted their temptation and hurried on before my resolve of fiscal conservatism melted away. Our time at the fair was short, as we arrived only forty-five minutes before closing time, and there was still much left to see! Our next stop at the fair was at the booth of Earle D. Vandekar of Knightsbridge (now based in Maryknoll, New York), where we were greeted by the affable Paul Vandekar, who owns and runs the business today. 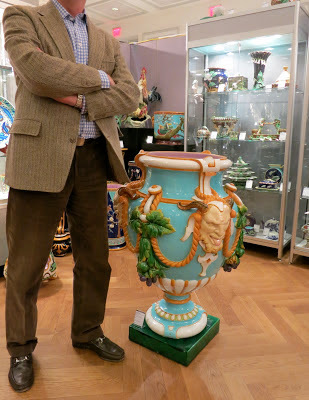 Like Mr. Howard, Mr. Vandekar specializes in English ceramics of the eighteenth and nineteenth centuries. We bought a charming small figure of a hunter from him several years ago. 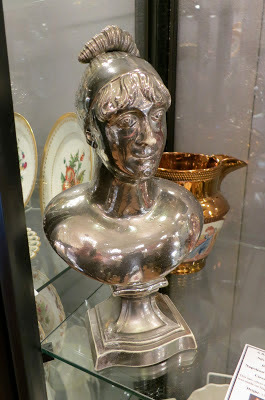 I admired an early-nineteenth-century silver luster bust of the Empress Josephine. It reminded me of ones featured in a post (since taken down) by Aesthete's Lament that were (then) being sold by the American dealer R. Louis Bofferding, a friend of the author. The ones in Aesthete's Lament's post were shown in photographs taken in the 1930s in a house in Lake Forest, Illinois, designed by David Adler and decorated by his sister, Francis Elkins. Some provenance! I also found myself lusting after a pair of early nineteenth century recumbent pearlware figures of Anthony and Cleopatra, in the Classical taste, as shown in the following photograph. They would look perfect sitting on one of the fire-surrounds at Darlington House. But no, Dear Reader, I remained steadfast in my fiscal resolve and forced myself onwards! a foot in length. Very impactful, indeed! 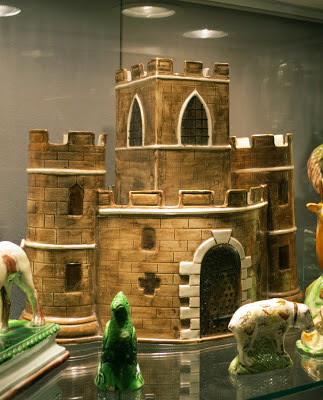 I became weak-kneed, however, in the very next booth to Mr. Vandekar's where I spied a large early-19th-century English pearlware Gothic castle, seen in the following photograph. 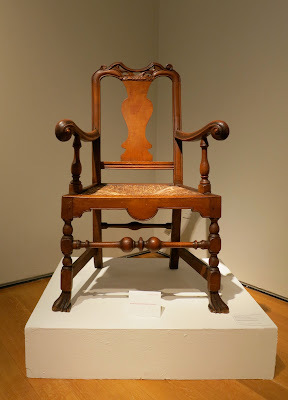 Of a substantial scale (it probably stands more than a foot tall), it is decorated on all sides, including front and back, as it was designed to sit in the middle of a dining table. How I would have loved to take it home with me to grace ours at Darlington House! But again, fortitude reigned. I didn't even dare ask the price, in case I was even more sorely tempted! In retrospect, I suspect that I shall always remember the little castle as one of the "ones that got away." If only I had room for such a thing. Ah well . . .
Every man wants to own his own castle, doesn't he? 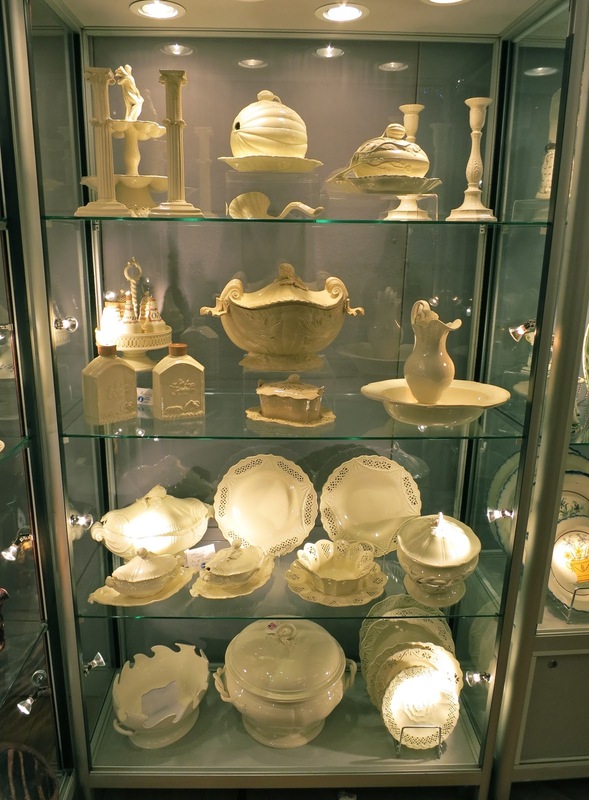 In addition to dealers specializing in the ceramics we collect, the Ceramics Fair has dealers specializing in wares outside our collecting sphere. 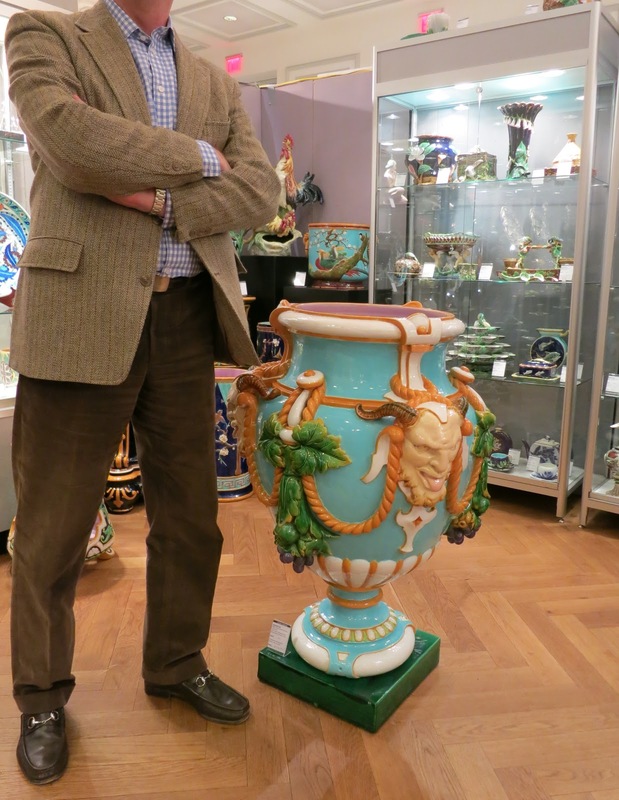 We were particularly impressed by the large, mid-19th-century English footed majolica urn shown in the next photograph. 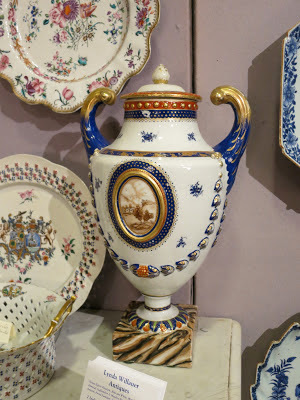 After pausing to admire the majolica urn we then made a bee-line to the booth of the good ladies Moylan-Smelkinson/The Spare Room Antiques of Baltimore. They also specialize in English ceramics of the eighteenth and nineteenth centuries (do you notice a theme here, Dear Reader? ), and are a must-see destination of ours at these (and other) shows. Not only are the ladies knowledgeable and carry a large inventory, but they are delightfully charming, too. Moylan-Smelkinson always have lots of beautifully decorated tablewares on display. 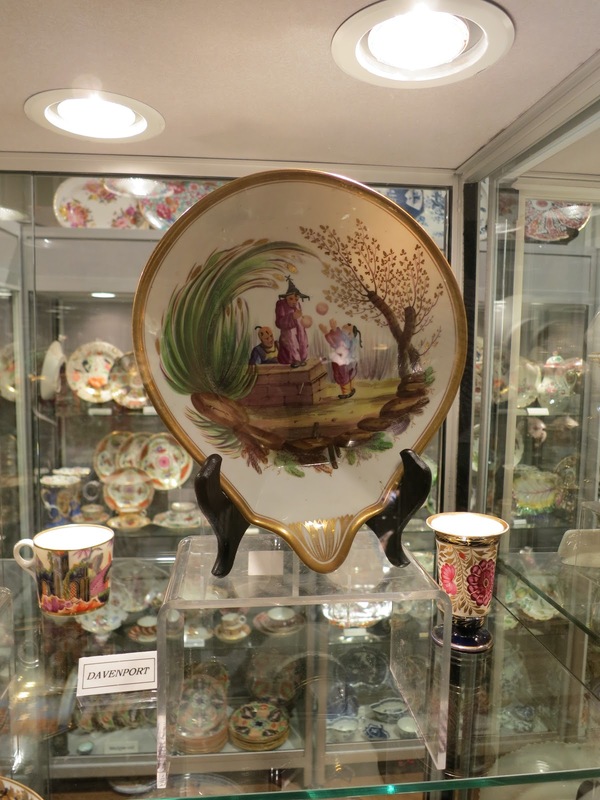 What a pretty Chinoiserie plate (one of a pair)! They also have a large assortment of delightful figures and delicious decorations to choose from. Along with several shelves of pretty ceramic snuff and patch boxes. But the standout in their booth this fair, at least in my humble opinion, is a gorgeous English ceramic tulip-shaped and decorated coffee service from the first half of the nineteenth century. It is breathtaking. One of the good ladies carried the booth's pretty floral theme to the sequined and beaded slippers upon her feet. Aren't they charming? Our destination on the balcony was the booth of Linda Willauer Antiques of Nantucket. We enjoy visiting her marvelous, jam-packed shop whenever we visit the island (where we have found a number of treasures in years past). We are also sure to look her up whenever she comes to New York for shows. 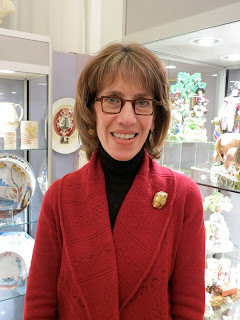 I'm always amazed at how much inventory Ms. Willauer brings with her when she exhibits in New York. Believe me, Dear Reader, it takes considerable foresight, planning, and flat-out labor to make such a display happen. Hats off to you, Ms. Willauer! 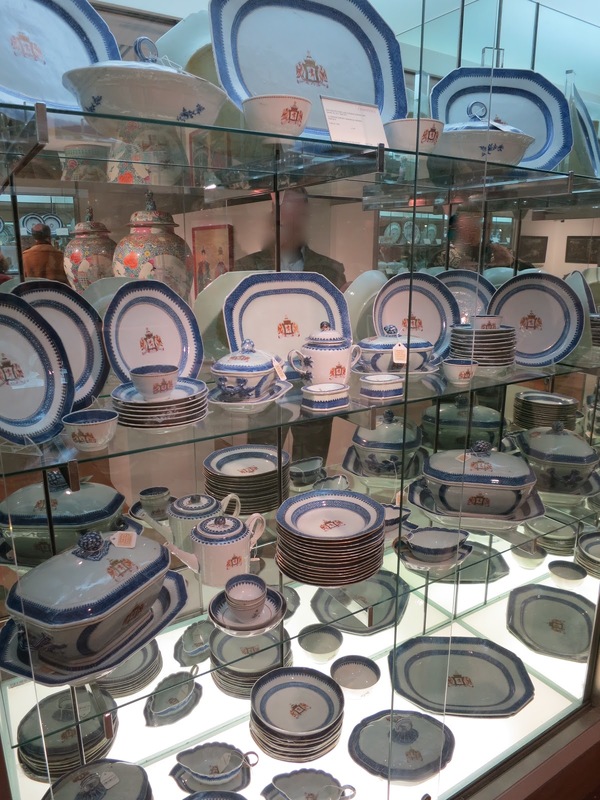 Ms. Willauer is justifiably well-known known for her extensive offerings of Chinese export porcelain and English Staffordshire. I thought this pair of Staffordshire hound spill vases were charming. 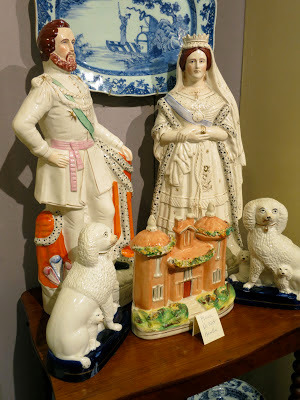 Ms. Willauer also has any number of mid-19th-century Staffordshire figures for sale, including these of Prince Albert and Queen Victoria. And with that, the closing gong rang and it was time to tear ourselves away from the fair! We took one last, longing look out over the main floor and then headed downstairs. Where we introduced ourselves to Nick Dawes of "Antiques Road Show" fame. 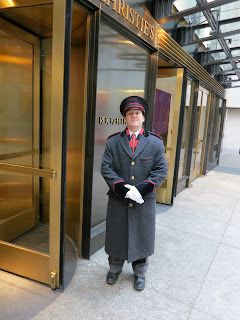 He was exceptionally pleasant and friendly. After leaving the Ceramics Fair we stopped in for cocktails and hamburgers at the nearby Finnegan's Wake, a friendly neighborhood Irish pub and a regular cheap 'n' cheerful destination of ours (Reggie doesn't only dine at the likes of La Grenouille, Dear Reader!). I can't recall whether I drowned my sorrows at "F.W." (as we call it) for not buying a thing at the Fair, or because I was celebrating my willpower for not doing so. 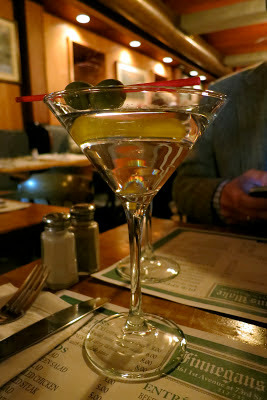 In any event, the martini (or was it two that I had?) 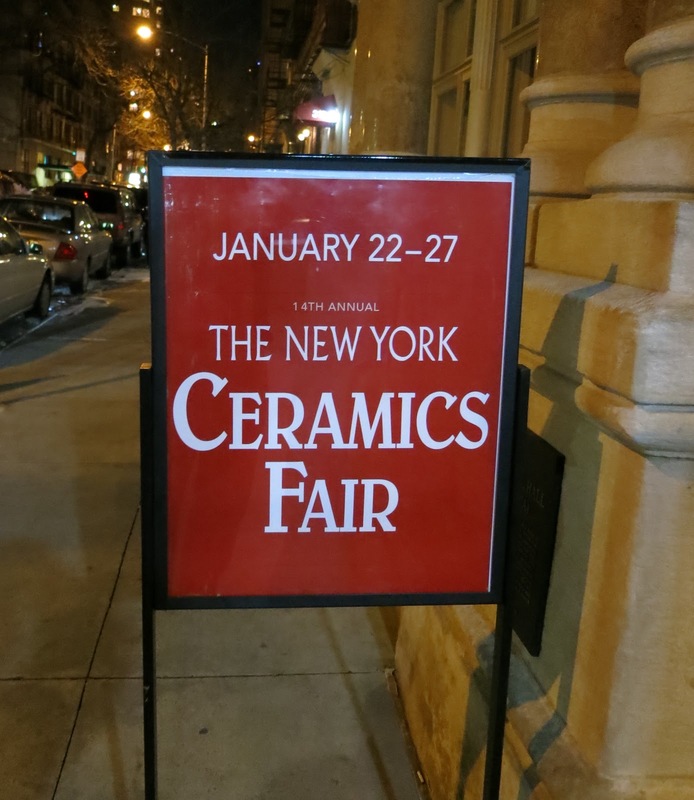 was a delicious topper to a most enjoyable tour of this year's New York Ceramics Fair. Please note: Dear Reader, should you find yourself in a position to go to the Ceramics Fair, you had better hurry up and do so as it closes this afternoon at 4 p.m. 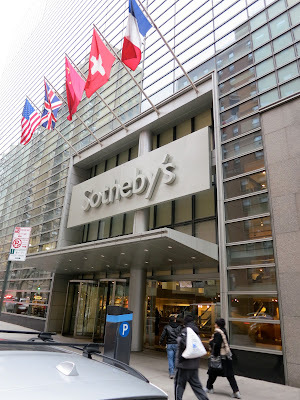 The next stop on our auction house preview perambulation was at Sotheby's on the Upper East Side. 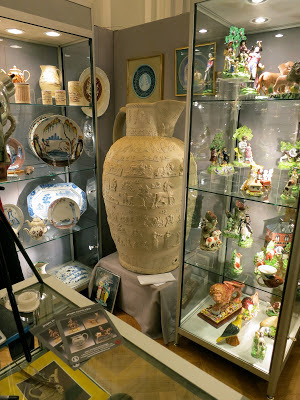 Sotheby's has a lot more on display in their showrooms this Antiques Week than Christie's does. In my experience, these two major auction houses trade places every other year or so in bringing in the most Americana to sell during Antiques Week. This year it was clearly Sotheby's turn to shine. When one enters the exhibition rooms at Sotheby's one is confronted by a monumental Federal-era clock attributed to Simon Willard (1753-1848), as seen in the following photograph. 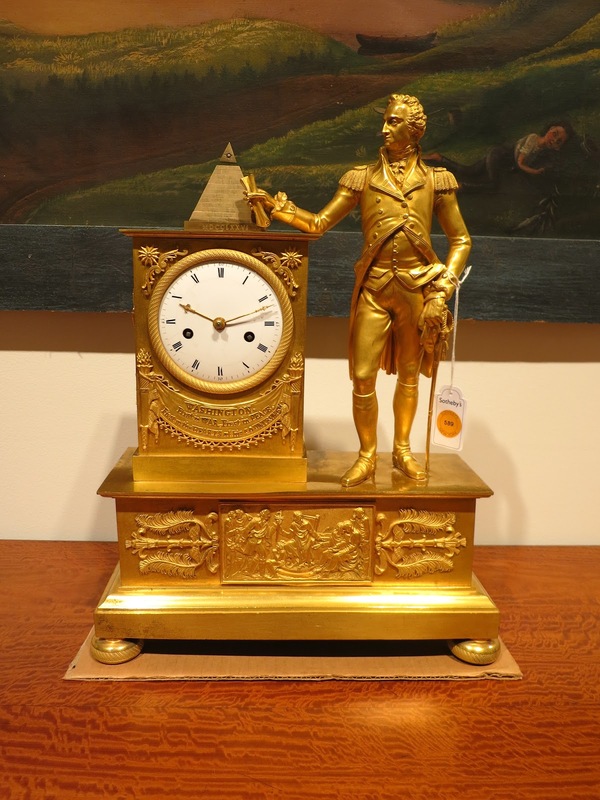 The clock's case is thought to have been carved by none other than the master carver Samuel McIntire (1757-1811). Even though the clock's face appears to be rather over-restored, at least to this writer's eye, it didn't detract from the timepiece's magnificence one bit. A nearly identical one is in the collection of the White House, in Washington, D.C.. Please note the Samuel Gragg bentwood armchair, ca. 1810 (estimated $6,000 to $12,000), on the left of the preceding photograph, Dear Reader, and the two klismos chairs in the foreground attributed to the Finlay Brothers of Baltimore, ca. 1810-1815 (estimated $80,000 to $120,000 for each). This is serious stuff, indeed. "A View of Mount Vernon with the Washington Family on the Terrace"
I was rather taken with this pencil and wash drawing of Mount Vernon by Benjamin Henry Latrobe (1765-1820). It once hung at Mount Vernon (it was a gift of the artist to George Washington the year before he died) and really should be returned there, I think. I hope the good ladies of the Mount Vernon Ladies Association are feeling flush these days and will find their way to returning the drawing to where it belongs, on the banks of the Potomac River. There were any number of Audubon prints in the Sotheby's sale, four of which can be seen in the preceding photograph. I'm often amazed at the prices such prints go for, with very rare ones sometimes selling in excess of $100,000. One of the highlights of the Sotheby's sale is this double portrait of a brother and sister painted by the New York itinerant artist Ammi Philips (1788-1865). It is estimated at an aggressive $250,000 to $300,000, which is far more than the $25,000 to $50,000 that a single person's portrait by this artist typically sells for in such sales. 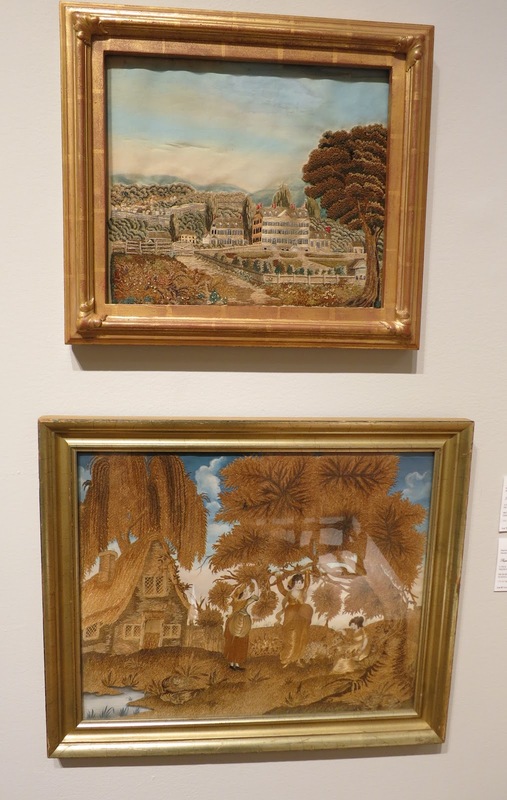 I confess that I was more taken by an assembled collection of early 19th-century gouaches of scenes in Italy. I particularly like the pair of paintings in the upper middle of the preceding photograph, depicting the watery interior of Grotto Azzurra in Capri (estimated $5,000 to $10,000 for the pair). The Sotheby's sale includes some outstanding chairs attributed to the Seymours of Boston. The chair shown here is one of a pair, although they are being sold separately. 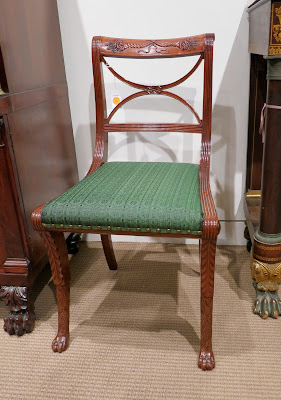 Personally, I prefer the much more reasonably estimated chairs in the sale attributed to Duncan Phyfe, which were once owned by Berry Tracy, the former curator of the American Wing at the Metropolitan Museum of Art. The chair shown above, also one of a pair, has the very desirable hairy paw feet that pushes prices for Phyfe chairs (and furniture in general) through the roof, and justifiably so—as they are killer. These Phyfe chairs are estimated to sell for a mere $5,000 and $15,000 for the pair (a bargain relative to the Seymour chairs, in my view). Even though Darlington House is packed to the gills these days, I'm sure I could find a place for the Phyfe chairs, at least if I really had to . . . In addition to examples of best-quality furniture made by name-brand cabinetmakers, the Sotheby's sale includes lots of good, hearty, unlabeled, unattributed, and handsome furniture that would make any homeowner proud. 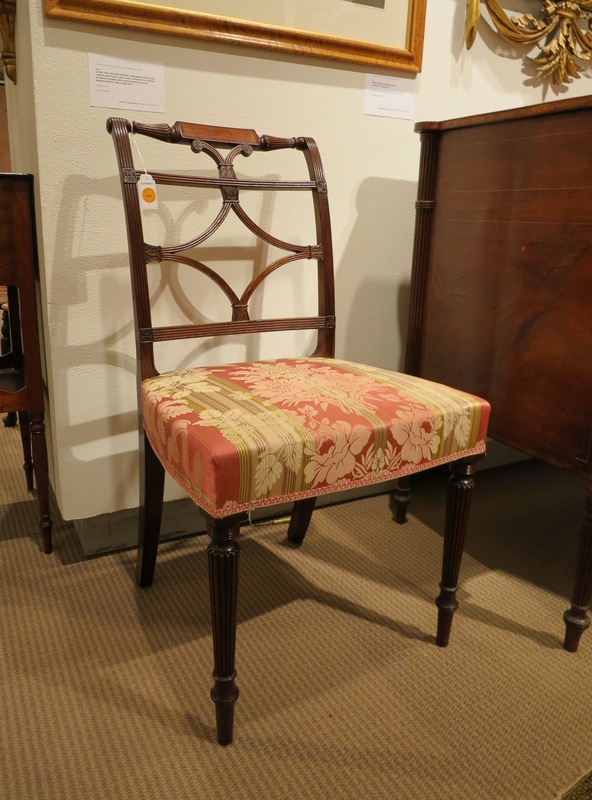 Much of the furniture on display is estimated to sell for reasonable prices, considering its quality and rarity. And what a value it is in today's markets, where mass-produced mid-20th-century options frequently cost substantially more! These days, antiques are really quite reasonable, indeed. What one will not find at a bargain basement price, though, is this superb example of a French gilt bronze Washington clock made for the American market, which Reggie would be more than happy to own should he have the extra jack required to cover the hammer price it is expected to go for. I suspect the clock—a trophy piece if there ever is one—will go for well above the estimate when the hammer falls. I was intrigued to see an excellent assortment of American Gothic Revival furniture at the Sotheby's preview. It almost made me want to go out and buy an Alexander Jackson Davis (1803-1892) designed villa along the Hudson River to furnish. I wonder . . . is that my life's next challenge? The Sotheby's sale has cases and cases of silver holloware, stemware, and presentation pieces. Do you really believe no one wants silver any more? The estimates were sufficiently high, in my view, to indicate that Sotheby's believes there are still serious collectors out there who would like to own it. I was interested to see there are a number of lots in the Sotheby's sale consigned by the Brooke Astor estate. 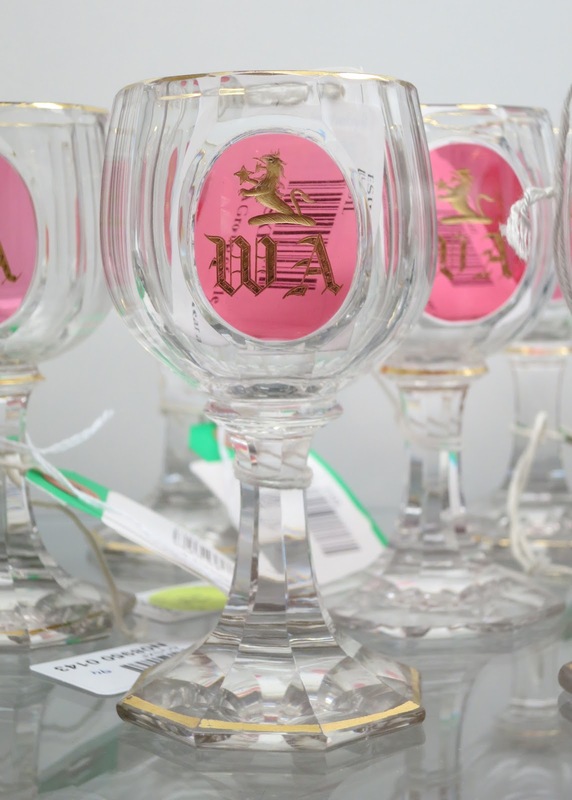 Disposing of the mother lode of Mrs. Astor's silver, china, crystal, furniture, jewelry, art, etc., has taken many, many months and any number of auction houses to effect. I wonder, is this the last of it? I believe these wine glasses may have once graced the table on Vincent Astor's yacht Nourmahal. For but a few thousand dollars they, too, can grace your dining room table. 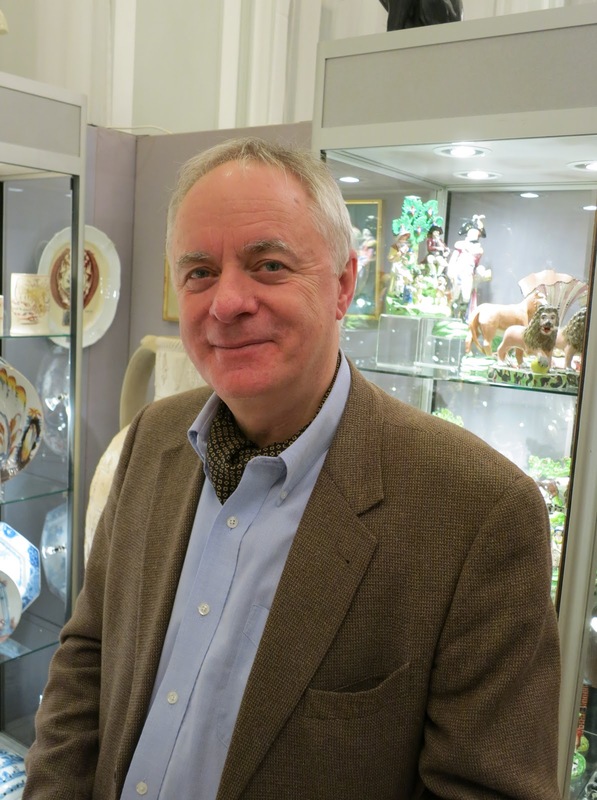 Antiques Week 2013 At Last! 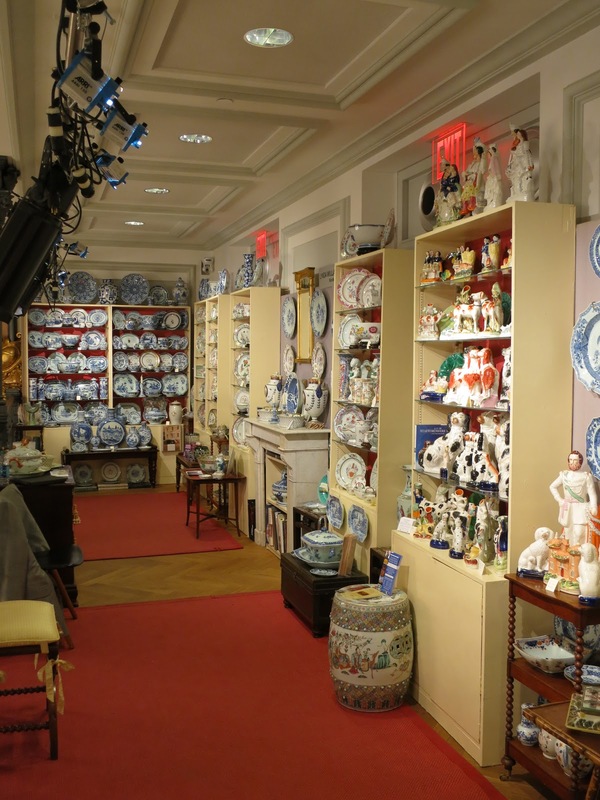 This week marks the official beginning of New York's Antiques Week. As many readers of this blog will recall, every January New York City hosts a week-long bazaar of antiques shows, auctions, and exhibitions that attract buyers and dealers from the world over. 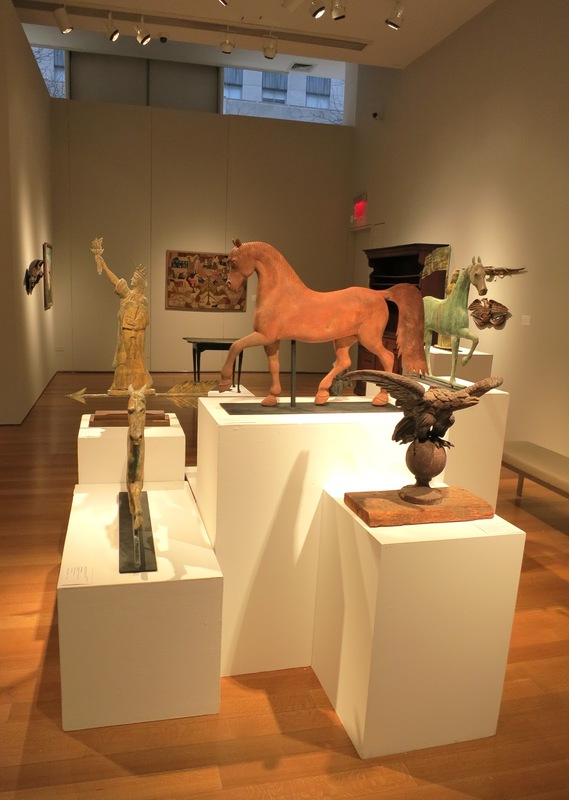 The centerpiece is the New York Winter Antiques Show, with satellite shows held throughout the city, and Americana auctions at the major auction houses. Antiques Week is one of the highlights of Reggie's winter—the Holidays are over, the cold weather has (finally) settled in, and one's attention hungers for something new. 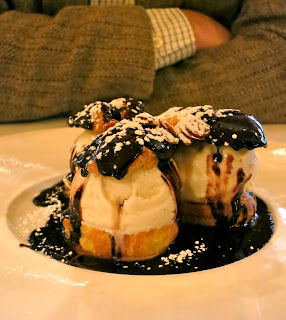 Well, at least in the case of this writer, one hungers for something old. 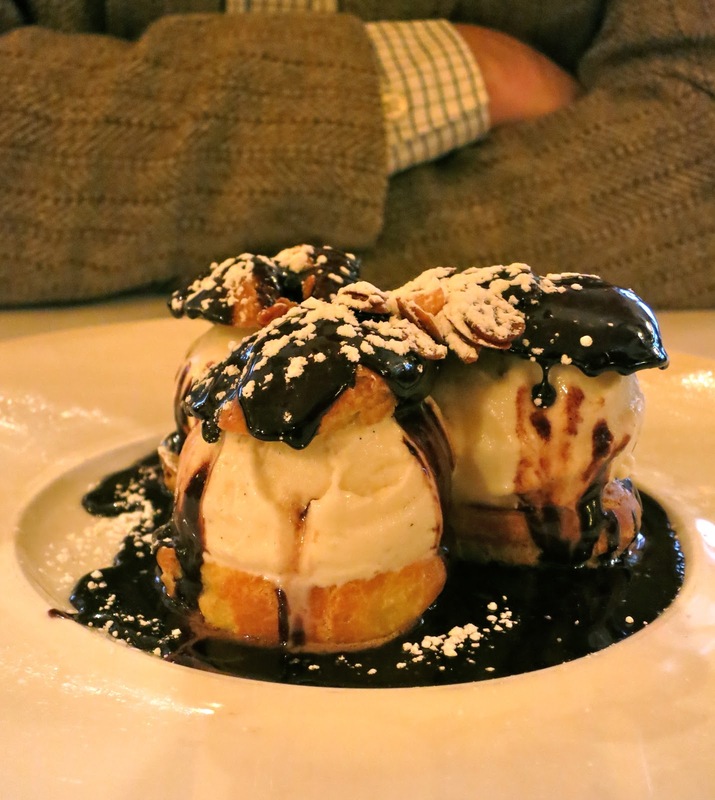 at Orsay Restaurant at Lexington and 75th Street. This year I'm taking a different tack to my usual postings about New York Antiques Week. In seasons past I've mostly focused on what we've bought at the shows, reporting after the fact. This year I'm going to write about the shows themselves. That's because I'm planning on keeping my pocketbook firmly clasped this year, and I'm determined to buy nothing. You see, Dear Reader, we've run out of space—there's no more room at Darlington House! We are more than thoroughly furnished, our walls are blanketed with pictures, and our cupboards are full to bursting. While I've approached previous Antiques Weeks with a similar resolve, this year I really mean it. Wish me luck, Dear Reader, in keeping to my resolve . . . 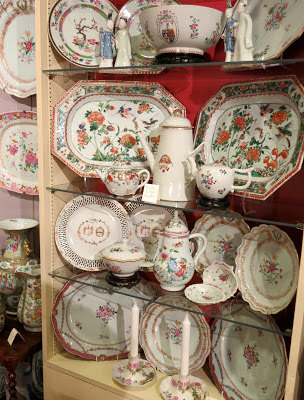 While Antiques Week officially kicks off on January 24th with the gala opening of the Winter Antiques Show, the auction houses begin previewing their Americana sales beforehand. 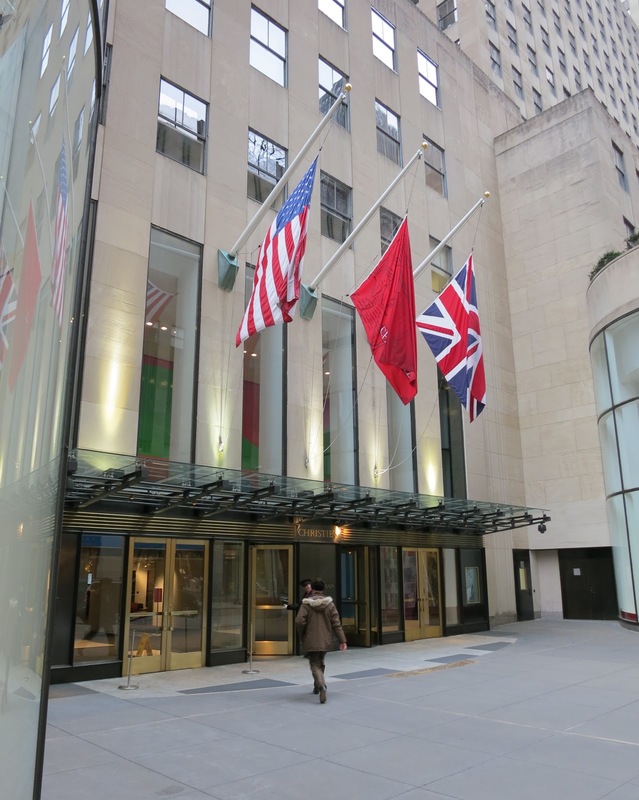 Today's post focuses on the preview held at Christie's, with the Sotheby's preview to follow. Rockefeller Center . . .
After fortifying ourselves with a lunch of steak frites and profiteroles at Orsay Restaurant we took a cab to Rockefeller Center to see Christie's preview of their upcoming Americana sales being held January 24th though 28th. I was most interested to see a pier table in the Christie's sale, ca. 1815-1819, by Charles-Honoré Lannuier (1779-1819). Lannuier was one of New York's greatest classical cabinetmakers and a contemporary and competitor of Duncan Phyfe (1770-1854). As readers of this blog may recall, we own a number of pieces of furniture attributed to Phyfe (or one of his equally competent competitors). The pier table is exceptionally rare in that (a) it is stamped by Lannuier, and (b) the columns and table top are made of green veined marble, as opposed to the white or black marbles one typically encounters. Even though the pier table is in "as found" condition and is missing some of its original elements, it is a work of sublime beauty and dignity. 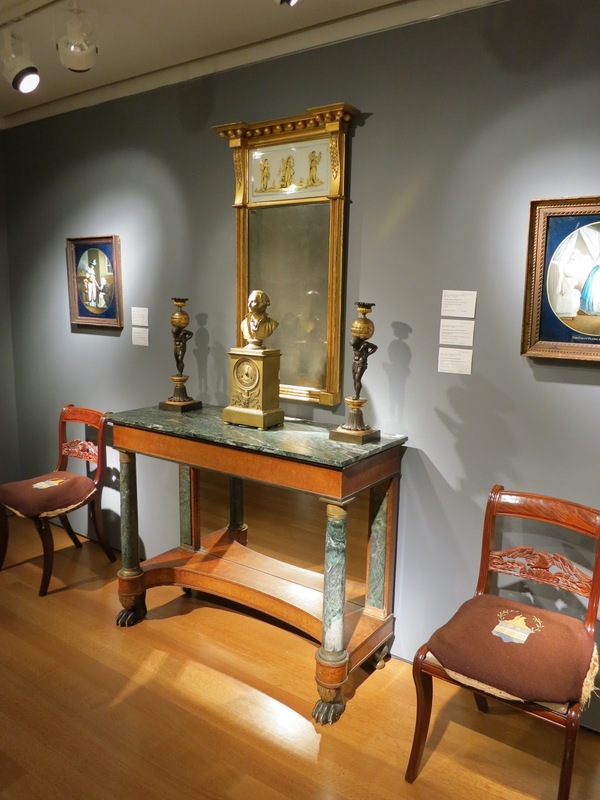 Most of the furniture and decorative arts displayed in the Christie's preview date from the late eighteenth century, with heavy emphasis on ball-and-claw footed pieces. There is rather a lot of American folk art, too, for those who collect such things. One of the highlights of the sale is a Queen Anne carved and turned maple armchair, ca. 1735-1743, attributed to John Ganes (1704-1743) of Portsmouth, New Hampshire. Christie's has done a lot of research on the chair, and it is featured prominently in the auction's catalog. The chair is highly attenuated and gutsy. It is impossible not to admire it. Collectors of needlework will find lots to love at the Christie's sale, as the auction house is selling the Stonington Collection's extensive holdings of schoolgirl needlework. 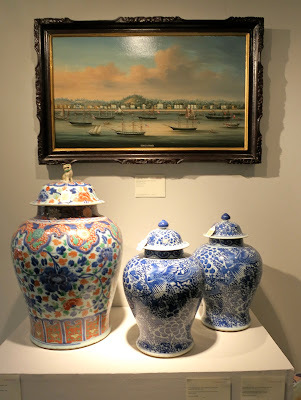 There is also a good showing of China Trade art and ceramics at the Christie's sale, as one would expect, given its Americana focus. There are several extensive sets of Chinese export porcelain on display. The highlight of the Chinese export porcelain is a subtantial service thought to have been commissioned for Thomas Jefferson (1743-1826). It is consigned by a direct descendant of the nation's third president and is being sold off in pieces with astronomically high estimates, given its association. 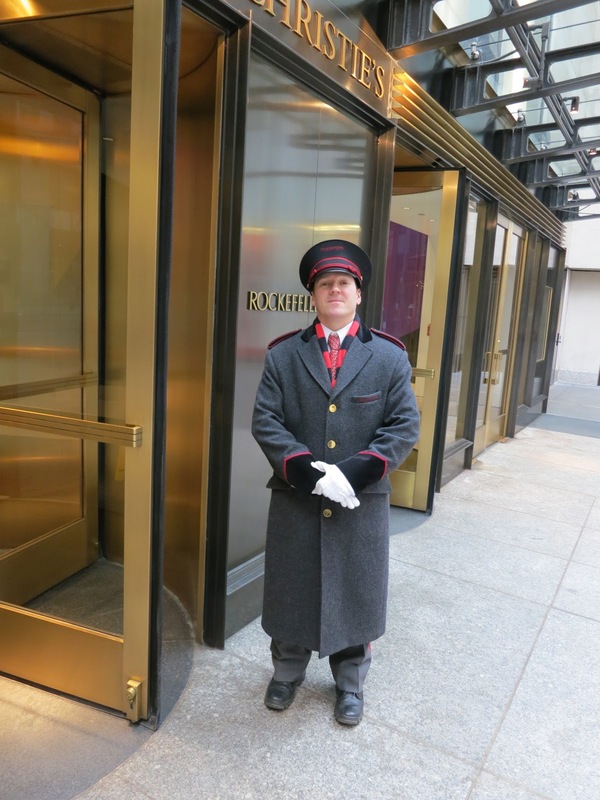 Although I was quite taken with the Jefferson service, I will not be bidding on any of it. 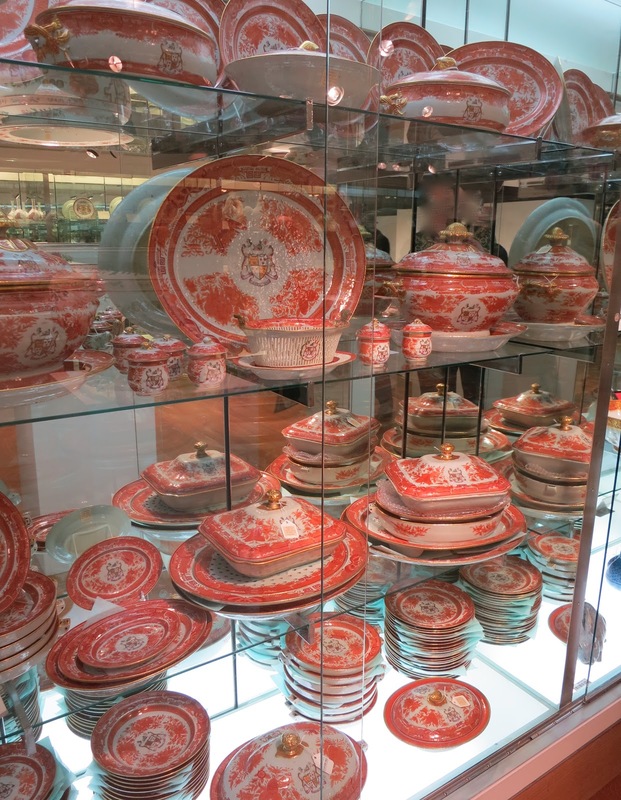 I already have more Chinese export porcelain than I know what to do with, most of which I have stored away for fear of careless housekeepers. Besides, given the high estimates, the Jefferson service is rather pricey for this writer's china budget. I hope that Monticello is feeling flush these days, as that is where the service belongs, in my view.